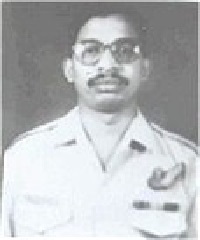 Sgt Pilla Venkata Narayan Ravi Prasad was born on 15 August 1965 at Elvru, Andhra Pradesh. Sgt Prasad joined the IAF on 18 January 1985 at the age of 20 years and underwent special training to become a Flight Gunner on in 1994. A very keen and energetic flier, Sgt PVNR Prasad had accumulated 1200 hours of accident/incident free flying to his credit. He was a very confident and dedicated aircrew and had taken part in various air operations during his service career. During 1999, Sgt PVNR Prasad was serving with No 152 squadron Helicopter Unit , operating Mi-17 helicopters. By May 1999, a large scale planned infiltration by militants backed by the Pakistan army, had been detected in Uri, Batallik and Drass sectors and Indian Armed Forces were ordered to clear the areas of the intruders. Along with the operations by the Army, IAF also undertook air operations to meet the objective. One such operation was undertaken by 152 Squadron in Drass sector. On May 28, Sgt PVNR Prasad was was flying as a flight gunner of a Mi-17 helicopter , piloted by Flt Lt Muhilan during an attack mission against ground positions strongly held by Pakistani infiltrators in the Drass sector. The enemy forces were well entrenched and were equipped with anti-aircraft guns and surface to air missiles to take on possible air attacks. The Mi-17 helicopter repeatedly carried out attacks in the face of fierce enemy opposition in the form of ground fire and missiles. Unfortunately in one of retaliatory actions by the enemy forces his helicopter got hit by the U.S made Stinger SAM(surface to air missile). Since the helicopter took a direct hit the damage caused was massive and the aircrew had no time to take any emergency manoevres. The helicopter crashed and the valiant air crew comprising Sqn Ldr Rajiv Pundir, Flt Lt S Muhilan, Sgt Raj Kishor Sahu and Sgt PVNR Prasad were martyred. Sgt PVNR Prasad displayed exemplary courage and bravery of the highest order. While in the face of intense enemy opposition, he carried out his functions in an exemplary fashion significantly contributing to the effectiveness of the crew as a whole. Sgt PVNR Prasad was a gallant air warrior and a committed soldier who laid down his life in the service of the nation. Sergeant PVNR Prasad is survived by his wife Mrs P Anuradha and daughter, P Hyndavi. Sir, The freedom we enjoy is only because of GREAT heroes like you! We salute the memory of Sgt. PVNR Prasad. May his soul rest in peace! May his family live the proud lives of a martyr’s family!